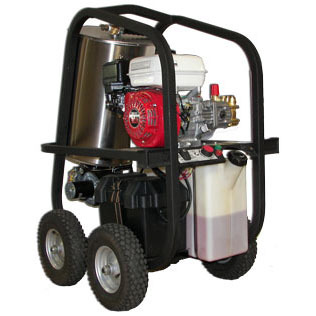 The Hydrotek SH40004HH Mobile Wash Skid-(Diesel fired) Gas Hot Pressure Washer is a SH Series and is a highly portable machine with a small footprint, ideal for use where electric power is not available. The industry trusted 13 HP Honda pull start engine provides power to the pump and thermostatically controlled 12 VDC Beckett burner. The engines have 20 AMP charging circuits. A down-stream injector gives the user hot soap control from the gun. 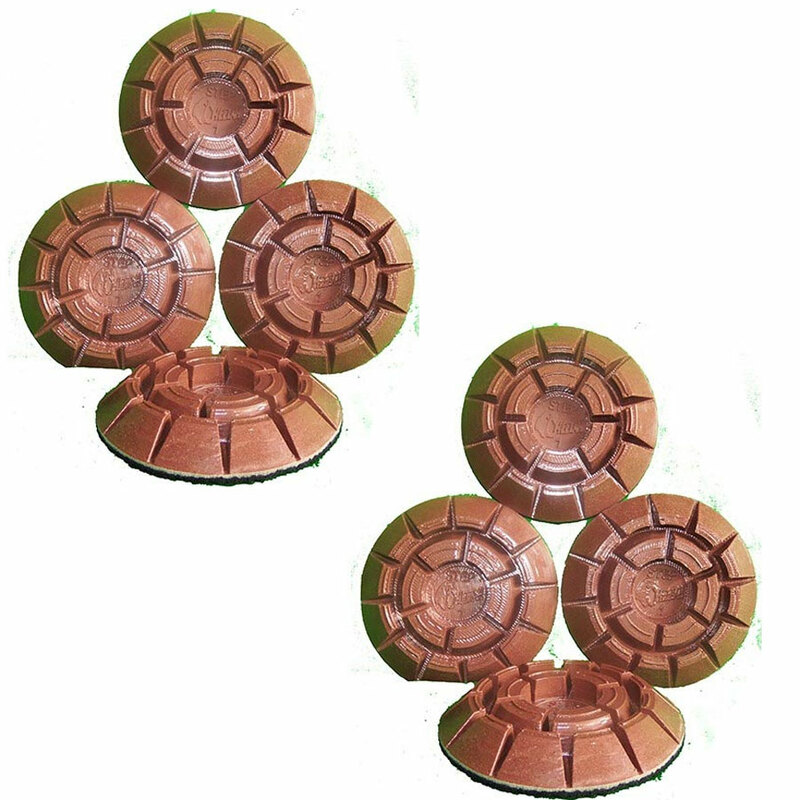 The STAINLESS STEEL wrapped 1/2" SCH 80 steel coil heats the water up to 250F. You will experience extended burner run time with the large 8.0 gallon diesel tank. The rugged powder coated frame has a lift point, integrated hose hooks and a big pneumatic wheel kit is included for portability. Industrial Rated S/S Wrapped SCH80 1/2" Steel Pipe Coil. Requires group 24 550 CCA battery, NOT INCLUDED. 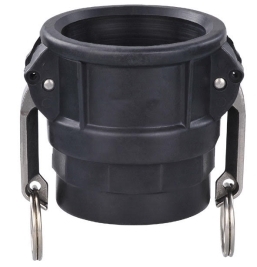 High temperature adjustable thermostat, up to 250°F wet steam. Integrated wand and hose storage. Dimensions: 44" Length x 28" Width x 45" Height. Group 24 550CCA battery, NOT INCLUDED. Downstream injection kit (#AC340), hour meter (AM512). Hydrotek collects sales tax in CA and TX. Steambrite's Gasoline Hot Pressure Washers - Hydrotek SH40004HH Mobile Wash Skid Diesel Fired Gas Hot Pressure Washer On Wheels 4000 psi 4 gpm FREE Shipping [SH40004HH] is . 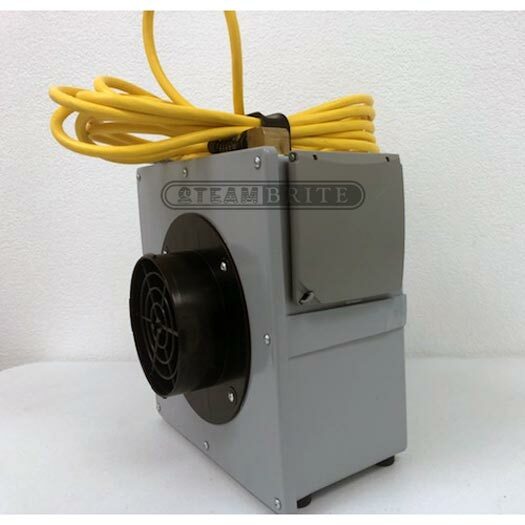 This product was added to our store on Tuesday 11 September, 2018. 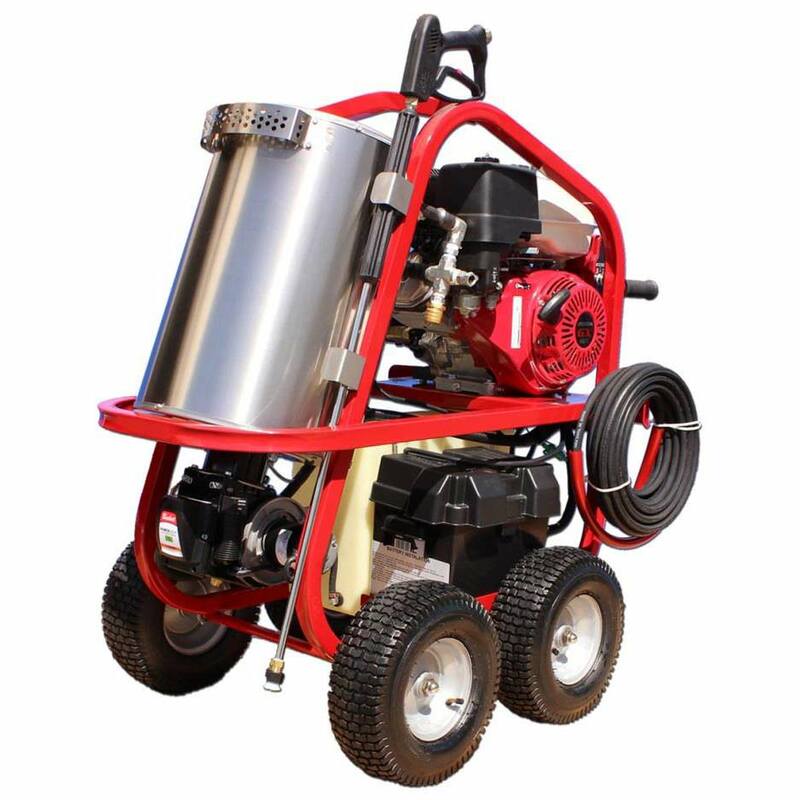 Steambrite will ship the Hydrotek SH40004HH Mobile Wash Skid Diesel Fired Gas Hot Pressure Washer On Wheels 4000 psi 4 gpm FREE Shipping [SH40004HH] by either Fedex or Freight Quote, and are normally shipped within 1-10 working days. Please remember it takes 6-8 working days for you to receive your order after shipment, and ground shipping times are not guaranteed. Next day and two day service are available. Click here for our full shipping policy. Specifications subject to change without notice. Steambrite's Gasoline Hot Pressure Washers - Hydrotek SH40004HH Mobile Wash Skid Diesel Fired Gas Hot Pressure Washer On Wheels 4000 psi 4 gpm FREE Shipping [SH40004HH].